Models are built to better inform decisions. Unfortunately, the numerous disparate outputs of statistical models are often difficult to make sense of for the decision makers and/or stakeholders. Compiling the risk of specific events potentially occurring in the future into a single variable can considerably assist the decision makers into comparing the various trade-offs between different scenarios. One of our long-time GoldSim users, Simon Chambert of Macroscopia submitted a model to our Model Library that is helpful for those looking for the recurrence interval of an event like a pond overflowing. Both the recurrence interval and exceedence probability are computed and displayed for a given set of input parameters that describe the pond design and constraints. This example can be used for other models that need to compute an annual recurrence interval. 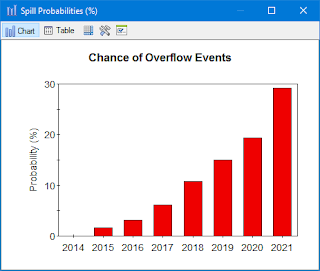 This model simulates a pond with runoff inflow that is increasing over a period of 8 years. 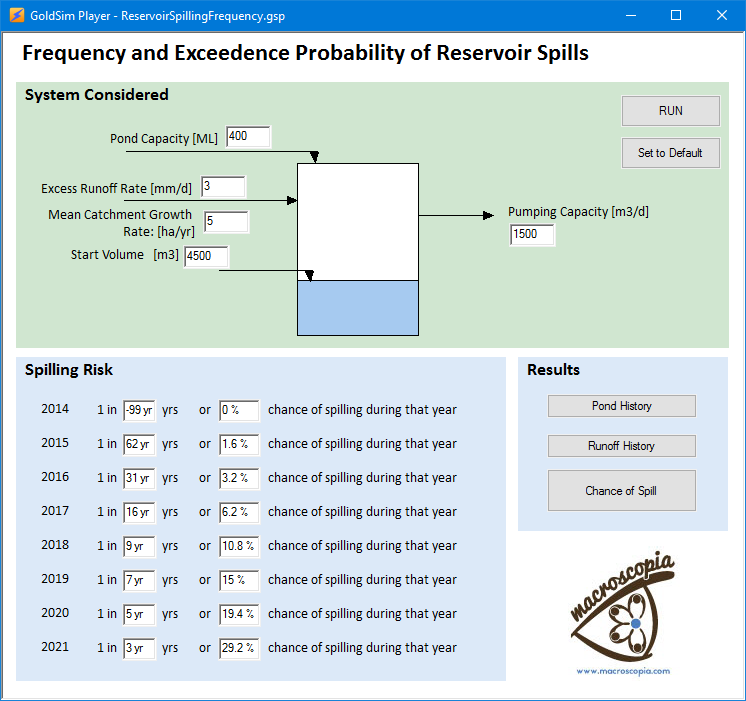 For each of these years, GoldSim calculates the risk of the pond spilling at least once during the year. As land usage over the catchment feeding the pond will change over time, together with changes in demands on the pond, the various risks (e.g. spilling, being able to maintain a certain level, being able to meet demands) will vary over the years. Computing the risk for each year and over the entire life cycle of the project allows for the identification of specific windows of years where the system might be more at risk than others. The calculation is illustrated here with a simple modeled system consisting of a pond being fed by a growing catchment. As the catchment grows, the risk of the pond spilling increases. 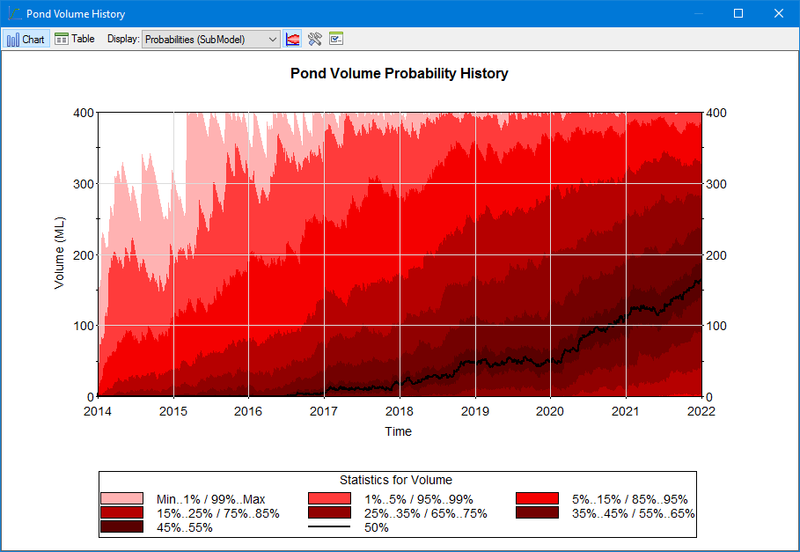 Here is a probability history plot showing the pond volume over time. Here is a screen capture of the model user interface, which allows you to see the recurrence interval and exceedence probability for each year of the simulation. If you are interested in viewing and using this model, please download it from our library, here. Please contact Simon Chambert at Macroscopia should you have any comments, suggestions, or questions about this model.